Chinese people believe that, as the Spring Festival is the start of a new year, what you do then will affect your luck in the coming year. There are many things you should not do. 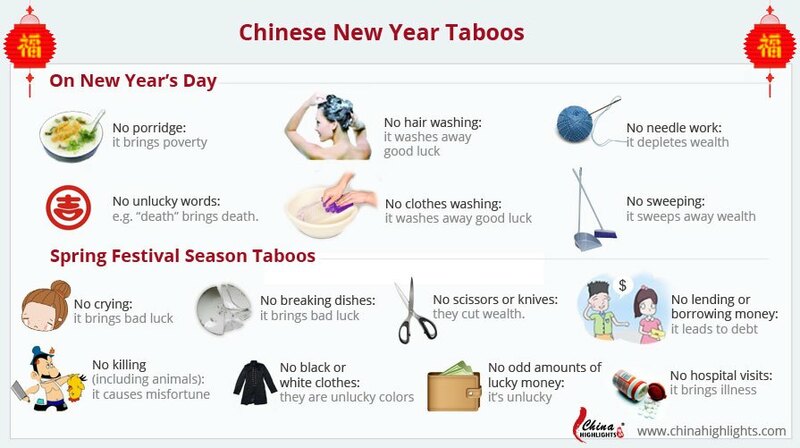 Traditionally many taboos are associated with the New Year Festival, but in recent years some of them have been discarded, especially among the modern urban populations in larger cities and the younger generation. 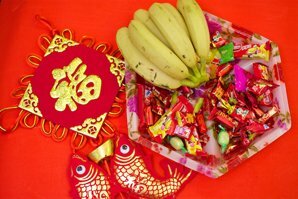 Here are top 6 things that people should avoid doing on the first day of the Chinese New Year. 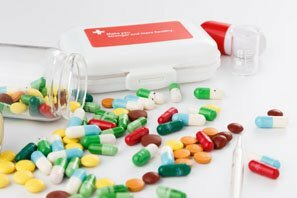 Avoid taking medicine at CNY. It is a taboo for a person to brew herbal medicine or take medicine on the first day of the lunar year, otherwise it is believed he or she will get ill for a whole year. In some places, after the bell announcing the New Year at midnight New Year&apos;s Day, sickly people break their gallipots (medicine pots) in the belief that this custom will drive the illness away in the coming year. 2. Don&apos;t sweep or take out garbage. The act of sweeping on this day is associated with sweeping wealth away. Taking out garbage symbolizes dumping out the good luck or good fortune from the house. 3. Don&apos;t eat porridge and meat for breakfast. 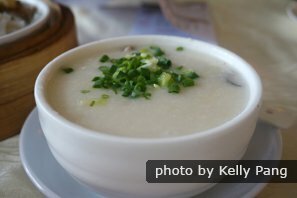 Porridge should not be eaten, because it is considered that only poor people have porridge for breakfast, and people don&apos;t want to start the year "poor" as this is a bad omen. Besides, meat should not be eaten at this breakfast out of respect for the (Buddhist) gods (who are believed to be against killing of animals), as all gods are expected to be out meeting and wishing a happy New Year to each other. 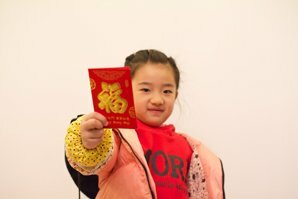 Click to see What to Eat at Chinese New Year to Bring Good Luck? 4. Don&apos;t wash clothes and hair. People do not wash clothes on the first and second day, because these two days are celebrated as the birthday of Shuishen (水神, the Water God). Hair must not be washed on the first day of the lunar year. 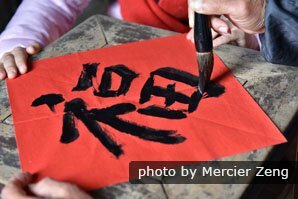 In Chinese language, hair (发) has the same pronunciation (and indeed is the same character) as fa in facai (发财), which means &apos;to become wealthy’. Therefore, it is seen as not a good thing to “wash one’s fortune away” at the beginning of the New Year. 5. Needle work should not be done. Needle work should not be done. The use of knives and scissors is to be avoided for any accident, whether harming a person or tool, is thought to lead to inauspicious things and the depletion of wealth in the coming year. 6. A married daughter is not allowed to visit the house of her parents. A married daughter is not allowed to visit the house of her parents, as this is believed to bring bad luck to the parents, causing economic hardship for the family. 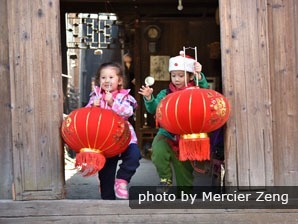 Traditionally a married daughter visits the house of her parents on the second day of Chinese New Year. Red is a lucky color in China. Breaking tools or other equipment during this period is associated with a loss of wealth for the coming year; therefore tradesmen and business people in general take great precautions to prevent it. A visit to the hospital during this period is believed to bring illness to the person in question for the duration of coming year; therefore visits to the hospital are avoided, except in cases of extreme emergency. Theft: Do not let other people take objects, including money, from your pocket during the Spring Festival, and take care not to have your pocket picked, as this is believed to portend your whole wealth in the coming year being stolen. Debt: Money should not be lent on New Year’s Day, and all debts have to be paid by New Year’s Eve, and, if someone who owes you money, do not go to his or her home to demand it. Anyone who does so it is said will be unlucky all the year. The rice jar should not be allowed to become empty. This causes grave anxiety, as the cessation of cooking during the New Year period is an ill omen. Damaged clothes: Do not wear new clothes that are damaged. 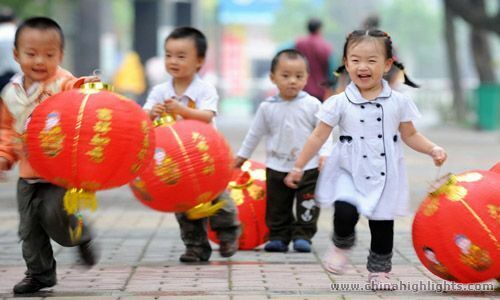 If kids especially wear such clothes in the first lunar month, it is said to bring bad luck. No killing. 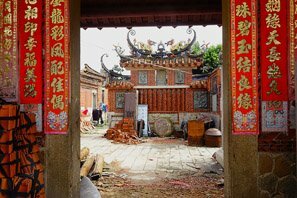 Killing in the Spring Festival should be avoided as blood is considered an ill omen, which will cause misfortunes such as a knife wound, or a bloody disaster. Do not wear white or black clothes as these two colors are associated with mourning traditionally.